BossLogic gives fans what they want with some new Aladdin art. The fan artist has taken Will Smith out as the Genie and replaced him with Robin Williams and it looks great. Late last week, Disney released a new trailer for their upcoming live-action remake that featured Smith as the blue genie and social media was freaked out by the introduction. One Disney critic wanted to use all three of his fictional wishes to unsee the latest version of the Genie in Aladdin. Robin Williams voiced the iconic blue Genie in the original animated Aladdin and to some, there isn't anybody that can do a better job. Disney famously let Williams roll off the cuff to create the character and give it his own identity. And for many, Williams is the only one for the job, as seen in the latest BossLogic art. However, Williams sady passed away in 2014, which meant that he wasn't a choice for the studio when casting was happening for the live-action remake. Disney and Will Smith are going for a different approach for the live-action Aladdin remake from what Robin Williams originally did with the character. Smith has said that he wanted to give the Genie more of a hip hop spin, which we haven't really seen yet, since we were only treated to a very small amount of footage. With that being said, the internet, for the most part, is not into what Disney and Smith have put together with the new look of the Genie. There was far less backlash when the first-look images revealed Smith as the character in human form, without the blue. For Disney to take some of their most beloved animated classics and remake them is a huge risk. This year alone sees the remake releases of Dumbo, Aladdin, and The Lion King, all within months of each other. While people are freaking out over Will Smith's version of the Genie, they're also angry that The Lion King doesn't look live-action. When it comes down to it, these remakes will be what some kids grow up with and will be their preferred ways to watch the movies in the future and for others, it might be a new twist on something that they've seen for decades. Will Smith was cautious about taking on the role in the Aladdin remake and was overly aware of the pressures of trying to replace Robin Williams. Instead of replacing, Smith went out and carved his own version of the character since the original is unreplaceable, which is pretty much what Disney is doing with their live-action remakes. 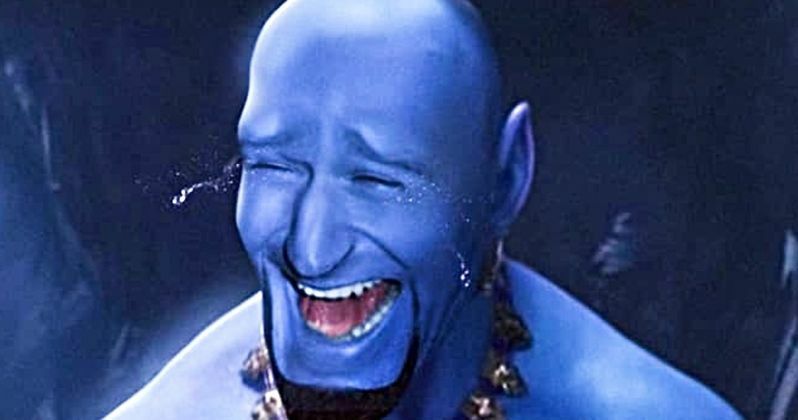 However, that is not going to stop social media from reacting to how Smith looks as the blue Genie in the Aladdin live-action remake. You can check out Robin Williams back as the iconic character below, thanks to BossLogic's Instagram account.